Denny Jump (Bellevue, WA, United States) on 7 January 2017 in Animal & Insect. This image (captured in February, 2014) is Still one of my personal favorites. I captured this at Merrill Creek Reservoir in Western New Jersey where we lived at that time. 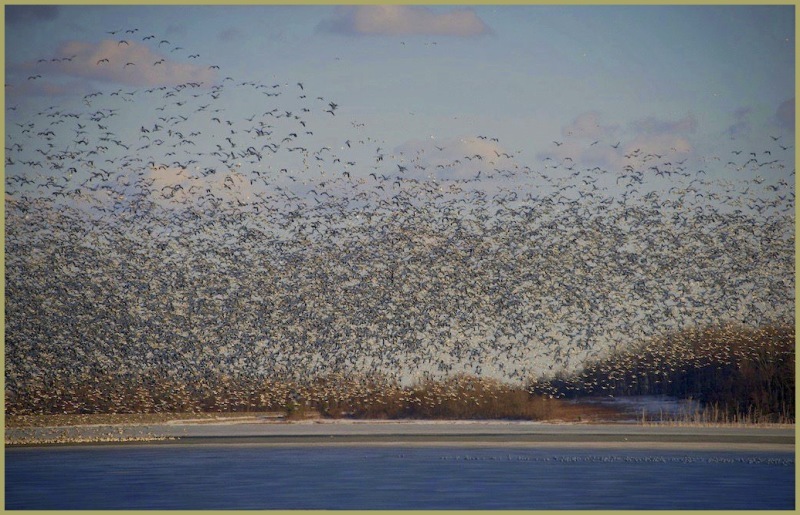 Each winter thousands upon thousands of Snow Geese would travel down from Northern Canada and Labrador to spend the relatively milder winter climate in Neww Jersey and Pennsylvania. I owe a Great debt of gratitude to my good friend, Julie Weller Finley - a Native New Jersey girl ;-) - I owe her great thanks for turning me on to this fantastic refuge known as Merrill Creek Reservoir. I'm sure it was deafening! That is a wonderful shot of all these gees in the air at once. They looks like a giant swarm - amazing sight! Yes, I can just imagine the sounds. Cool shot. Love to have the whole image invaded by wings of freedom, it's beautiful, the tones too ! Indeed . . must be an unforgettable experience of sight and sound . . a timelessness about it.